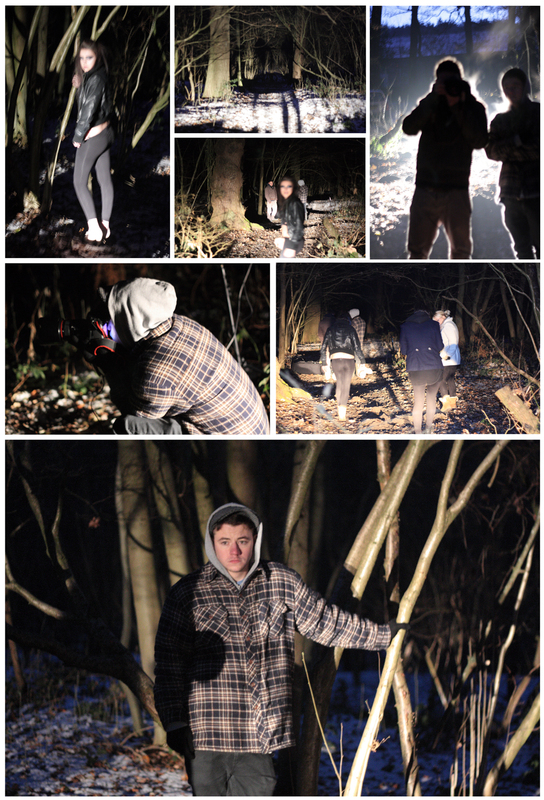 So I've recently taken part on another collaborative shoot, this time in a quiet woodland area. Great thinking on my part eh...? It was freezing, as it were shot the week when we had the rather bad snow at the end of Nov' 2010. The shoot wasn't what we planned and was a very rushed job. It was part of a collaborative shoot for one of my degree projects. (Working with two other photographers & three MUAs - one posed as the model). We had a portable lighting kit set-up in the a quiet woodlands close to my home. My car main beams were the only thing illuminating the woods, as there are no street lights near by, meaning the sky was also pitch black for once. It was only about 5.30pm, but it gets dark crazily early these days, don't you think? Originally the shoot was going to be in a warehouse which contained old style (20s) machinery, which would have been pretty cool. We had the lighting ideas, make-up, all of it sorted - but less than 24hrs before we had bad news that the company who owned the building had gone in to liquidation, meaning we were no longer able to use the location. This is why we ended up in the woods, quick thinking and idea changes. We had a mixture of different props, fake snow, smoke bombs, old photo frames. I'd never used smoke bombs before, and thought they'd be a pretty cool purchase. They are probably one of thee most awkward things to light in the freezing cold, but are definitely something i'll use again. I've yet to find a situation to use the snow though, as quite unusually for England it has almost snowed non-stop for a month. I love it, I dislike how the UK are so incompetent with the situation though. Back to the shoot, I personally didn't really like the outcome of it. I didn't physically take any of the 'actual' photos, but as it's a collaborative shoot they are supposedly 'all of ours'. I had a go at editing, so I'll post that on here. I actually prefer the behind the scenes shots which I took, especially the bigger one at the bottom of the collage. All of the BTS images were taken using natural lighting, with an ISO of 1600. I'm thankful to my car for lighting up the scene, otherwise the shoot probably wouldn't have gone ahead. Luckily for me, my car was fine getting out of the parking spot, (it wasn't a proper road, just a muddy track) unfortunately one of the other photographers got stuck meaning the other had to push him out of his spot, for this I thank my car twice. I think I'm going to have hunt for a portable building light, just to light up future scenes. The photo which I'm not too keen on! I'll reproduce it but better, eventually. I am eager to have another go at getting the shot I were hoping for though, this will most likely be after Christmas now, as I don't have access to the sufficient lighting equipment. I really want to get some good shots that are portfolio worthy - I'm not too keen on studio photos any more, those created by others are fine but I much prefer working on location and having more creativity/spontaneous options. I've lots more ideas planned out in my sketchbook, it's just finding the right modes/location/time & money to produce them.